Released August 29, 2017, Sloclap’s Absolver presents itself boldly. An online fighting game with a focus on martial arts and the mastery thereof, little is given in the way of story, as, like most martial arts movies, the focus is centered on the action. After creating a character, you’re shown a quick cinematic, then immediately placed in a world and told, “Fight.” Your objective is simple: defeat specific enemies called Marked Ones to work your way up a large central tower and become the Absolver. Because you’ll be climbing this tower with your fists, it’s important you get to know them well. 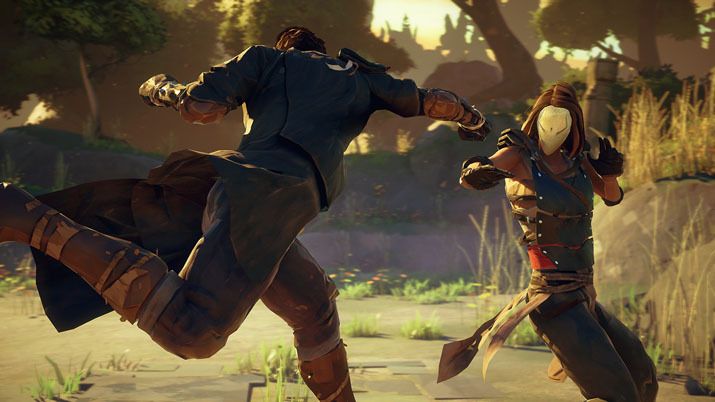 Fighting and learning different fighting styles make up the majority of Absolver. From the outset, you choose a particular defensive mechanic that you prefer (dodge, parry, or absorb), then you are placed in a tutorial area to learn the basic moves you use for the rest of the adventure. Outside of standard mechanics, fighting styles and how you customize them are the biggest draw to Absolver. Combat appears deep, with player-built combos that lead into one another, despite comprising of only two buttons: a heavy and light attack. Moves interact with each other through four “stances” that yield different starting movesets, but constantly change and fluctuate between one another with each attack, either automatically or manually by player choice. Players are given “decks” of moves they can swap out and rearrange as they please to create a better flow for one’s own play style. At first, the amount of slots and moves are limited, but as you progress, you can learn new styles and moves, fleshing out your options. You also net experience from fights, which is spent on increasing player stats, namely strength, dexterity, vitality, endurance, and will. Mobility is the sixth stat, which is affected by current equipment. All of these have an effect on gameplay in a fairly standard way, with the exception of will, which relates to how many “shards” your player can hold at a time. Shards represent levels of a special meter, which you use to perform special moves, the first of which is a healing burst that regenerates health slowly, or quickly when dealing damage to an enemy, and stops once the player receives damage. Shard energy is gained by successfully using your style’s defensive moves in a fight, and can be saved in-between fights to be carried on to the next. More special moves are discovered with each Marked One that is defeated, and can be swapped in or out between fights. Visually, Absolver is certainly striking; a rather distinct art style helps separate it from other titles with what could be described as an almost digital watercolor painting aesthetic. Splashes of color help break up the environment’s ruins with patches of grass, flowers, and moss. Players are fairly drab in appearance, perhaps to make fights less distracting, which is a good decision when you’re expected to pay attention to movesets and how to avoid/reverse them. Light and shadows do well to cover the environment, but never in a way that makes visibility a challenge. Music in Absolver is best described as extremely minimalistic. The sound of crashing waves or chirping birds can be clearly heard over the airy guitar arrangements. You’ll become extremely aware of the sound of your character’s footsteps as you walk and run around the environments. The punches and grunts of fighting will obviously be the most familiar sounds heard, and are performed well. There aren’t yells or screams, just standard grunts as from thrown punches and landed hits. The overall quietness of Absolver’s world adds to the intensity of fights, keeping the player engaged in who they’re facing, rather than where they are. So how does Absolver play and feel? One-on-one fights are well executed and what the engine was built for. Be it against the AI or another player, these fights can be anything from quick and easy, to overwhelmingly difficult, but it’s when you find that sweet spot where you’re faced against an evenly matched challenger that everything feels right. Such fights help showcase that player progression is tied more to personal skill rather than pure levels, although levels definitely help. Unfortunately, not all fights are one-on-one. Many battles, including boss fights, require the player to face off against multiple opponents, which can turn into a clustercuss reminiscent of gang violence. In such cases, it’s practically impossible to come out unscathed. I’ve had multiple times where I’ve been locked in a stumbling animation as one enemy after another mercilessly beat me into a corner. Guarding eats up stamina during these riots, and dodging leaves you open for another enemy’s attacks. Even the camera fights against the player in these moments, either obscuring oncoming enemies from behind you, or getting stuck in the terrain. Adding to the frustration, once you die, you lose any moveset experience you would’ve gained in that fight, and any enemies you did beat will typically respawn. This means that if you’re stuck in a section where you have to fight a group that is much stronger than you and you don’t want to repeat the fight over and over, your only real options are to either run past them, if possible, or leave and grind out experience until you’re able to power through them. Another option available is to team up with other players and work through the level that way, assuming players in your area have an interest in cooperating. If they are available and accepting, pairing up with them can, unfortunately, bring its own set of problems, as multiple times I’ve experienced glitches when I’ve buddied up with just one other player. The most common issue I’ve faced is that of the enemies completely ignoring one of the players and concentrating on the other. At these times, one teammate can wail on enemies without fear of retaliation, while the other has to suffer through the group up of enemies focusing their all into them until they die. Other times enemies have completely frozen in place, unable to be interacted with until you reloaded the game. My least favorite problem occured when I had to start a new game after I cleared an area with another player. For some reason, when we parted ways, my character was thrown through the map into another area that I couldn’t get out of. Additional glitches I experienced included freezes, crashes, and a completely black screen — each required me to force-close and restart the program. Absolver can make you feel like you’re banging your head against a brick wall over and over. 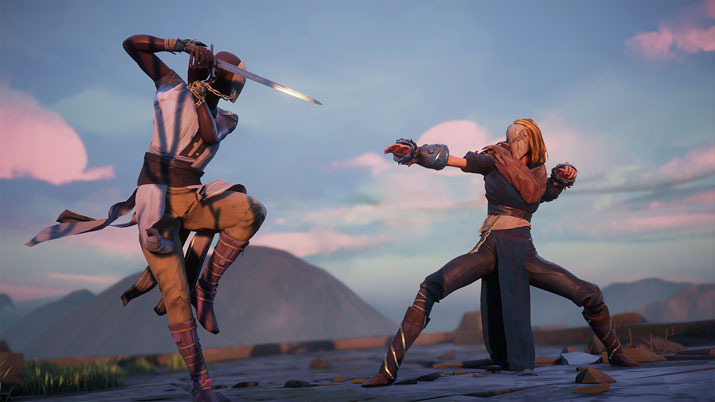 Fighting is the major focus of Absolver, but learning new moves felt extremely draining and grindy, as you’re required to face an opponent who is using a specific move in order to learn it. They may have the exact same moveset as you, plus the move you’re trying to learn, but then may never use it during your fight. Often times, enemies with a completely different moveset are not only the strongest enemies in the area, aside from the boss, but they’re also typically accompanied by two or three other enemies, making it a pain to get to them and fight them fairly. Another way to learn new moves is through the PVP arena called Combat Trials. Upon entering the arena, you’ll be matched up with a random player where you both fight to the death, first to three wins. Unfortunately, there is no ELO or skill rating system to pit you against an evenly matched player, and many times I consistently fought against players 20 levels above me. Combine all of this with the fact that any gained experience during the fight is lost upon death, and Absolver can make you feel like you’re banging your head against a brick wall over and over. Perhaps at higher levels, this is an extremely enjoyable game, but in my time with Absolver, I didn’t find that. The moments that I did have a good time and thought that the combat system was genius were few and far inbetween, often overlooked and bogged down by repetitious fights and long periods of grinding out moves and experience. The glitches I experienced were not rare, according to a quick google search of similar complaints, but thankfully Sloclap is aware of most of these problems and is releasing patches to help eliminate them, while also adding new features. Currently, endgame content is purely PVP to get new gear, but the addition of 3v3 and a ranked mode is planned to be released soon. Customizing the fight deck is certainly an interesting mechanic that can help players find their own unique play style or technique flow, but acquiring new moves and leveling up current moves can make the experience feel exhausting. If you’re looking for crazy flashy combos and special moves, this isn’t the title for you. While Absolver is a fighting game, it’s a far cry from the likes of Street Fighter, Tekken, or Injustice. With many moves grounded in reality, or at least inspired by them, Absolver’s combat system still requires strategy, but even moreso patience — a quality for which many do not play fighting games.